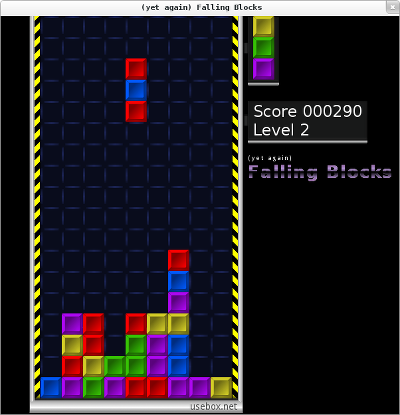 This is a “falling blocks” game (see Tetris or Columns) developed from scratch in a weekend to learn about Pyglet. The mechanics are pretty much like in Columns, although blocks can’t be matched in diagonal (making the game a little bit more difficult). If a joystick / gamepad is present it will be used instead of the keyboard. For further information (ie. controls) read the README file. For the windows bundle, just uncompress the ZIP file and run ya-falling- blocks (or ya-fb-fullscreen to run the game in full screen mode).